"The search ends here! Who Unfollowed Me is an absolute must to manage your Twitter growth!" – engagement mag. 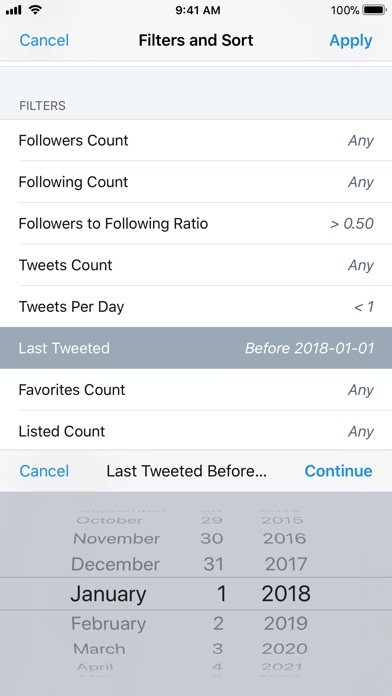 In order to help you get the most out of your network, we ask for your Twitter data permission — and we handle this responsibility with utmost care. We take all precautions necessary to ensure your privacy is respected and your information is secure. We never follow or unfollow anyone by ourselves. We also never post any Tweets at all! No spam! 6 years of trust to back the claims! Visualize your relationships and opportunities! 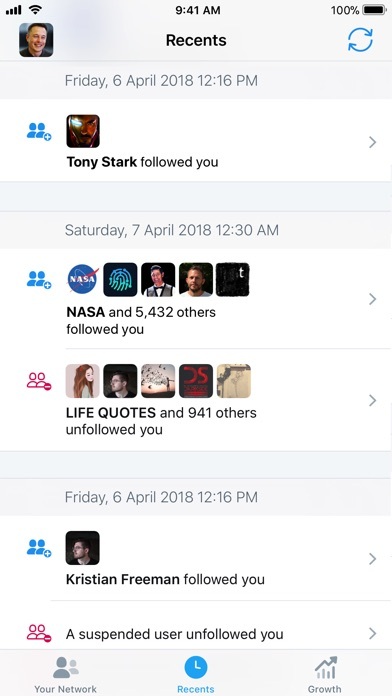 See people who don't follow you back!, or even your fans whom you don't follow back. Heck, even people you are mutually following, your "friends"! See everyone who followed or unfollowed you, and even those who you followed or unfollowed! 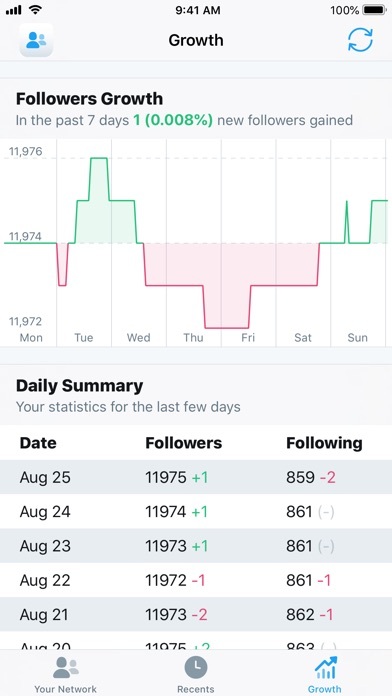 See a visual chart of your followers growth over time! And this is just the beginning! 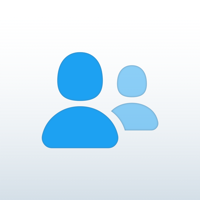 Easily manage the people you're blocking and muting from one place! It keeps getting better! Easily search for names, bio, locations, or websites of people in your network! 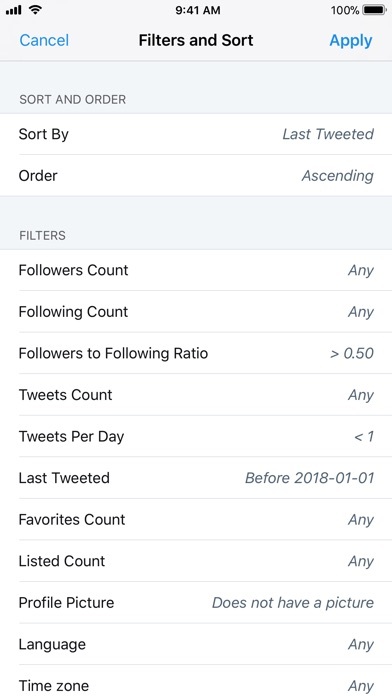 Filter and sort people in your network based on 23 different search parameters, including when they last tweeted, joined twitter, or how much followers-to-following ratio they have! That's not even all! It's crazy! 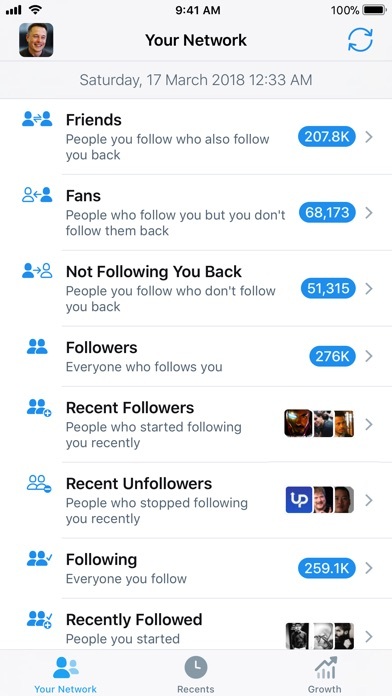 Go back to your first followers and unfollowers from when you first started using the app! Ready to manage accounts of any size! 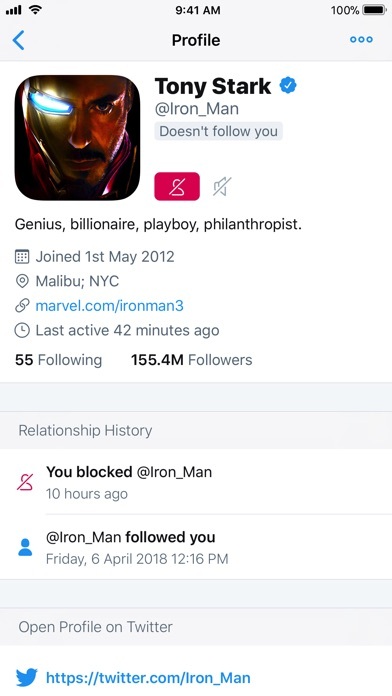 We're successfully handling celebrity accounts with 16M+ followers! **Your Relationship History** with others! 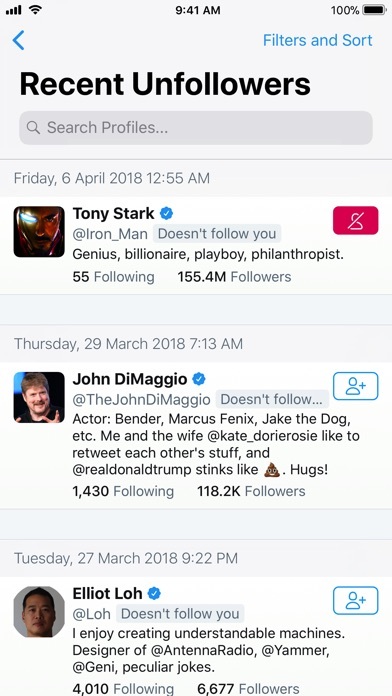 Go to anyone's profile, and you'll know when they followed / unfollowed you, and vice versa! 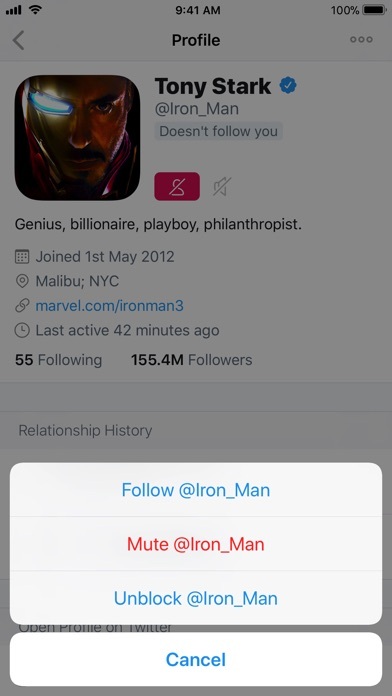 Or even when you muted or blocked them! It remembers everything! 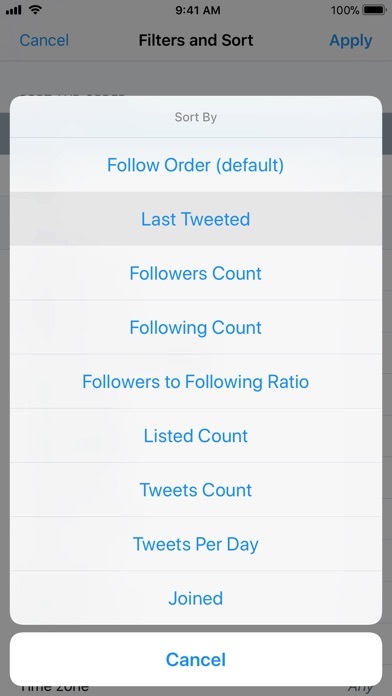 Who Unfollowed Me is designed to work perfectly on iPhone as well as the iPad! 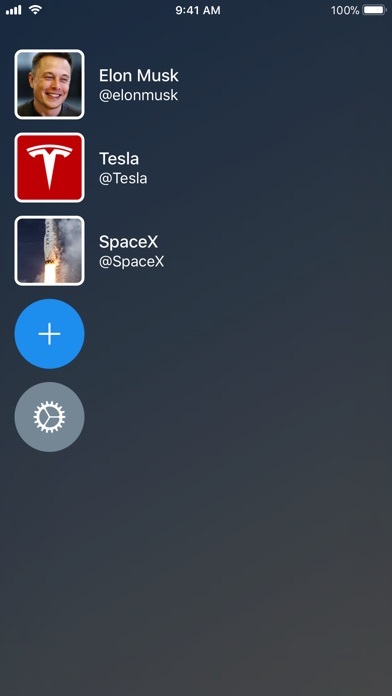 Who Unfollowed Me’s main version is free, and you can easily upgrade your membership within the app. Payments will be charged to your iTunes account after confirmation of purchase. Subscription automatically renews unless cancelled at least 24 hours before the end of the current period. Your subscription can be managed in your iTunes Account Settings after purchase. Subscriptions cannot be cancelled for the current active period. However, subscription upgrades are pro-rated (adjusted for remaining period).